(Natural News) Researchers have recently modified a degradable bioplastic made from corn starch and other natural resources that can be used in the production of more eco-friendly electronic parts. A team of researchers from the Nanjing University of Science & Technology in China looked into the possibility of using polylactic acid (PLA) as an electronic component. Polylactic acid is a readily-available bioplastic made from corn starch and other natural materials, and is currently used in the electronics, automotive, and packaging industries. However, researchers noted that PLA is brittle and flammable. The bioplastic also does not contain the right electrical properties that make for good electronic substrate or insulator, the researchers said. The research team incorporated metal-organic framework nanoparticles into the bioplastic to address this challenge. As a result, the experts developed a transparent film that contains electrical, mechanical and flame retardant properties that make it potentially useful in electronics production. The results were published in the journal Industrial & Engineering Chemistry Research, the flagship publication of the American Chemical Society. The new material may show potential in addressing the current electronic waste burden, which continues to worsen year after year. In fact, a report by the United Nations University revealed that consumers around the world discarded about 42 million metric tons of electronic waste in 2014 alone. A report published in the EHS Journal also revealed that developed economies contributed largely to the electronic waste burden. According to the report, the U.S. accounted for 24 percent of the global electronic waste burden, while the European Union was responsible for more than 22 percent of global electronic waste. 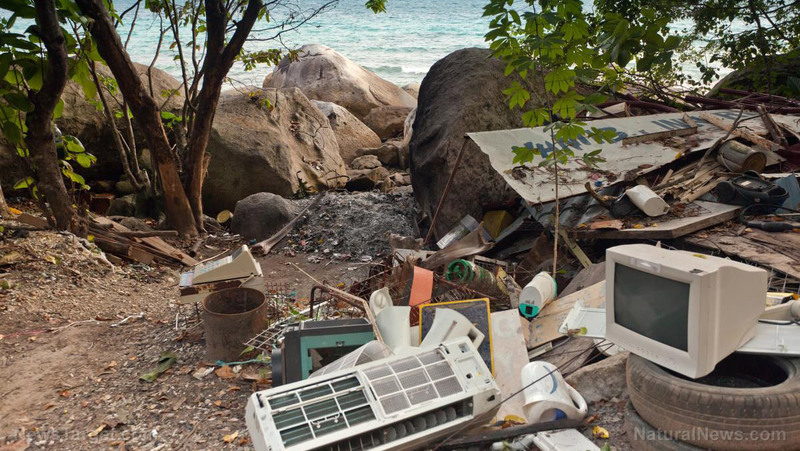 The report also found that developing countries manage and recycle 13 percent of the world’s electronic waste. Informal recycling markets in certain countries — such as the Philippines, China, and Vietnam as well as India and Pakistan — process 5o to 80 percent of the global electronic waste. According to the World Health Organization (WHO), valuable metals found in electronic waste such as gold and copper have been a source of income for people who recycle these products. However, the WHO cautioned that old recycling techniques such as burning cables render both children and adults susceptible to various health risks. The organization also stressed that recycling electronic waste through burning exposes people to various toxic chemicals such as lead, cadmium and chromium as well as brominated flame retardants and polychlorinated biphenyls. A large number of studies have also demonstrated the adverse effects of exposure to these chemicals as a result of electronic waste recycling. A 2014 study looked at the effects of exposure to 20 potentially toxic chemicals in people who worked at three formal e-waste recycling plants in Sweden. The research team found that airborne exposure to toxic chemicals was 10 to 30 times higher in recycling workers compared with office workers. The study also revealed that recycling workers had higher concentrations of hazardous chemicals — including chromium, cobalt, indium, lead, and mercury — in their blood, urine, and plasma samples compared with office workers. The results were published in the journal Environmental International. An analysis also revealed that exposure to electronic waste was associated with thyroid issues, behavioral changes, and decreased lung function. The review also noted that electronic waste exposure was linked to higher rates of spontaneous abortions, stillbirths and premature births as well as lower birth weight and length. People living in recycling facilities also exhibited greater DNA damage compared with the controls, the analysis showed. The results were published in the journal The Lancet. Is it possible to recycle lithium ion batteries?